According to CNET the A-Series will ship with an OLED screen, larger than the current model's screen size of 2.8 inches, most likely 3.0 inches. As for the S-Series, it should feature a TruBlack LCD display. The new A-Series will come in 4 capacities, 8, 16, 32 and 64 GB and ship with MDR-EX0300 headphones, at least this is what was tested with the A-Series in the FCC report. The MDR-EX0300 headphones ship with the S640 in Japan and are not Noise-Cancellation headphones, so perhaps the production A-Series will come with the same headphones as the current A-Series. The new S-Series will be available in 2 capacities, 8 and 16 GB and will ship with MDR-EX083 headphones which don't appear to be that great and are not in-ear headphones. CNET has a bit more info on colours and pricing, which could mean that the product announced is due soon, but the pricing I would not take too seriously since all CNET did was convert current Euro model prices to US, which is inaccurate. I should also mention that both models have went thru certification in South Korea which means that these 2 models will be global. Product announcements should take place at IFA 2011. Pricing after the break. Thanks Ben for the heads up. Thanks for the info ascariss. I note a couple of things about the a-series: (1) it must be coming with NC given the symbol above the headphone jack & (2) the dimensions of the device and the number of buttons on the side seem to strongly point to a touch interface (i.e. there looks like back/pause/fwd buttons as well as the usual volume buttons). So assuming CNet is right about Android not being the OS then it's looking like the new a-series will be a follow up to the x-series. This is exciting! I hope the A-series makes it to the U.S. and Canada. Would love a 64GB player from Sony. The new A series will be on sale in Canada and the US. And yes Bob I agree, it appears to be a similar design to the X, with either the NC switch in the middle or that's a hold button. It will be interesting to see what resolution the screen will have, hopefully higher than the current A-Series screen or the X-Series screen. Hi. Do you have any info regarding the EU volume limit restriction? Thanks. But I do warn you, enter the service menu at your own risk and the directions may not always work for other walkmans. 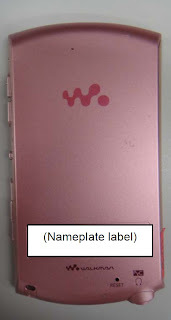 I really want my MP3 player..
Bring all the cool Walkman to the United States. I agree with the earlier poster about on the go deleting/playlists. If they are featured then I'm definately buying the NWZ-A867 to replace my X series, if not then I will probably turn my back on Walkman.